No experience required. 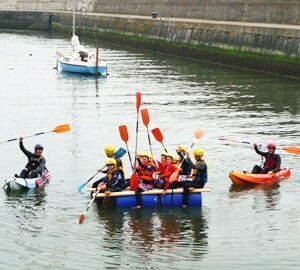 This is a two hour introductory lesson to kayaking based around learning and fun, held in the sheltered waters of Bray Harbour you will be shown basic paddling and self rescue techniques. 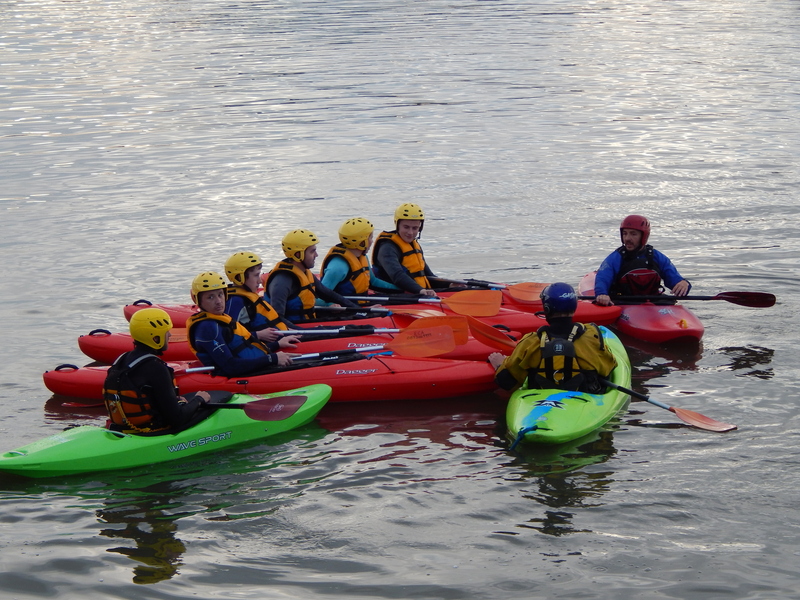 We use Mambo sit on top kayaks which are both stable and fun and have plenty of kayaking games to teach you. *Please note a minimum of two people needed for session to proceed. 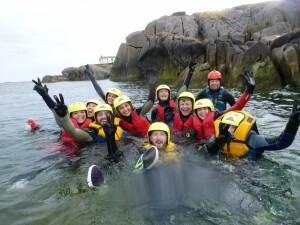 If you are booking for one please contact Bray Adventures directly. Starting at Bray harbour and finishing in Greystones Harbour. 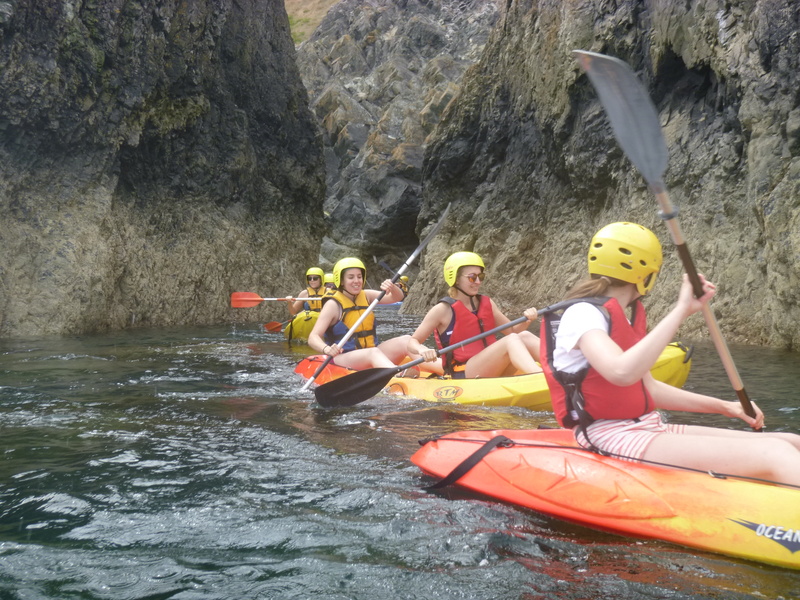 This kayak tour takes you along the famous Bray head cliff walk route. The scenery is incredible as is the wildlife. Full training is given and all equipment provided. Minimum groups of 8 adults. No experience required. This is five two hour lessons designed to bring your kayaking skills up to ICU level 2 personal skills. It can be run over a weekend or one night a week. Held in the sheltered waters of Bray harbour You will learn paddling strokes and rescue techniques as well as important do’s and don’ts from our friendly instructors who work with small groups to make sure you get the most out of the course. This is an ICU certified course and makes a great treat or present. Once this course is completed you will be allowed to hire kayaking equipment. Stand up Paddling is a traditional Hawaiian Sport which promotes balance, fitness and a whole lot of fun! The fastest growing paddle sport in the world right now. 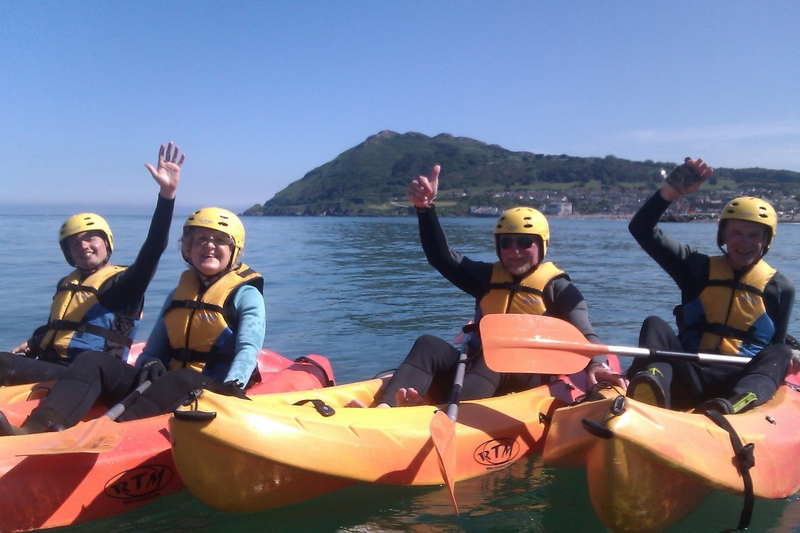 Starting out in the calm and sheltered waters of Bray Harbour, you will be amazed how easy and addictive this sport is. Anyone can give this sport a try, and falling in is all part of the experience! All equipment including your wetsuit, buoyancy aid and helmet is supplied you will need to bring a towel, swimsuit and water shoes. This is an introductory two hour paddle session with our friendly instructor. You will be shown the basic paddle and self rescue techniques as well important do`s and don`ts that will make this like a totally awesome day out dude. *Please note a minimum of two people needed for session to proceed. 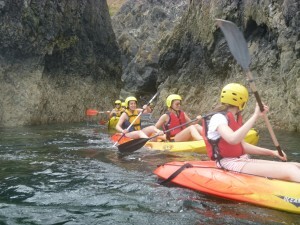 If you are booking for one please contact Bray Adventures directly. No experience required. This course is for anyone who would like to progress their Supping skills. It consists of four two hour lessons. 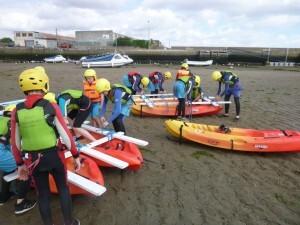 Held in the sheltered waters of Bray Harbour you will learn important do’s and don’ts as well as improved paddling strokes and self – rescue techniques. Our friendly instructors will teach you Surf etiquette, weather and tide awareness to get you ready for paddling along the coast. Once this course is completed you will be allowed to hire Supping equipment. I.C.U. Certificate on completion. This is a two hour session designed for anyone who has completed the Sup progression session. Time to leave the Harbour and head for the strand, this is perfect for those lazy summer days when your looking for something different to do. You can expect to see plenty of wildlife such as seabirds, seals and the occasional Dolphin. Supping is a great way to keep fit and exercise (or supercise as it’s being called) and you might even get into some surf. A great, fun exercise in team work! 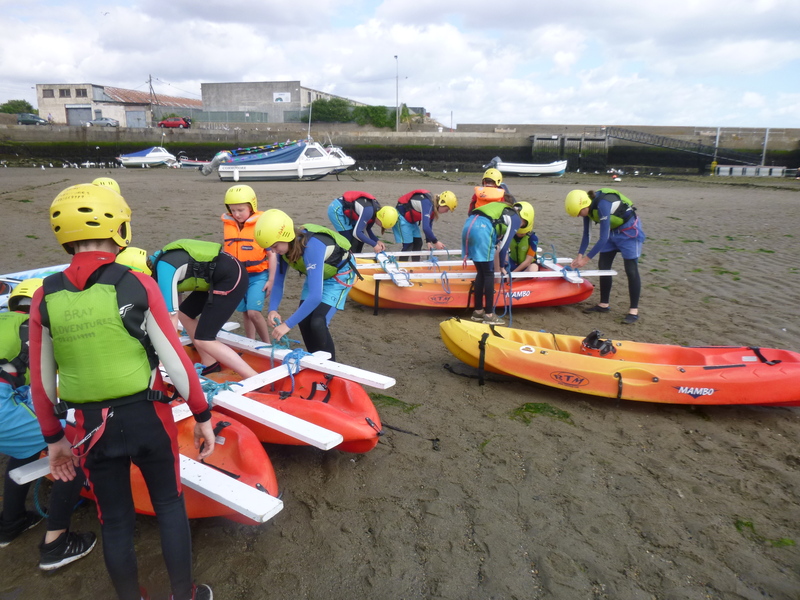 The challenge of building a raft is all about working together as a team, an invaluable lesson for children, helping them realise that working together for a common goal is both a challenge and very rewarding, and boosting their self confidence and confidence in others. Likewise, on a corporate day out this will help you and your colleagues, co-workers, employees and employers work together as a team with a common goal, building good relationships to take back the work place and instilling a team mentality. The challenge is not only to build the raft, but to paddle it too, again working together to cooperate and coordinate moving in the same direction. And, just for added fun, there’s some tasks and games thrown in too! All the makings for a fun filled action packed day out, with a valuable core message to take away too. 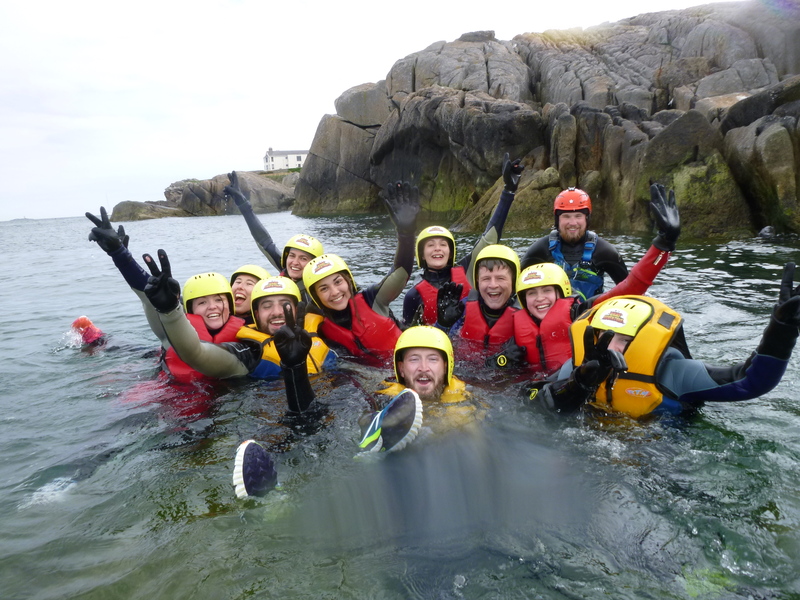 All equipment is supplied, including wetsuits, buoyancy aid & helmet. Please bring towel, swim suit and pair of water shoes. This is our newest and most exciting action packed activity. 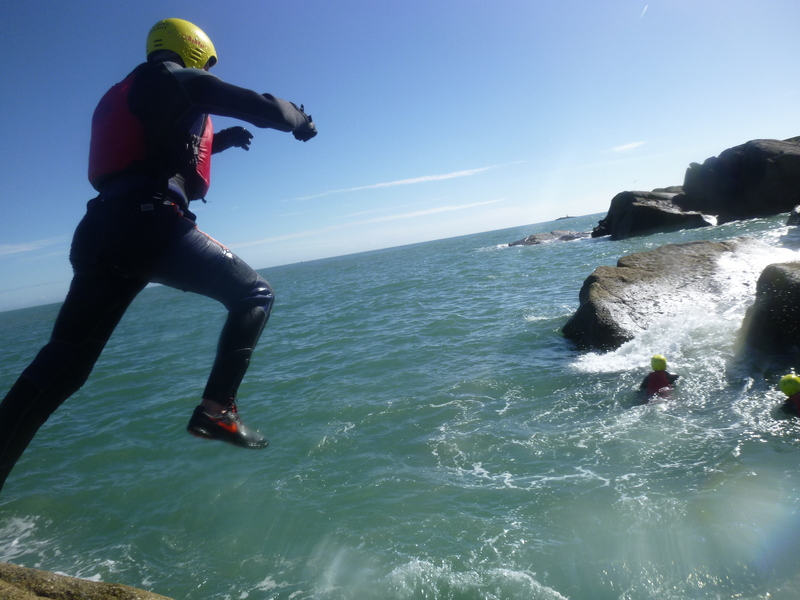 Coasteering is the ultimate aquatic adventure. It involves Rock Climbing, Sea Swimming, Caving and Cliff Jumping. This is the most fun you can have in a wetsuit! Basic swimming is needed 50 metres. All equipment is supplied, including wetsuits. All you need is a towel, trainers, swimsuit & sun cream. Come and explore the Garden County! Wicklow is a hillwalkers delight. We are located under the beautiful backdrop of Bray Head, which boasts spectacular views over the Dublin and Wicklow Coastline, taking in views of Dalkey Island, as well as views of the Dublin and Wicklow Mountains beyond. 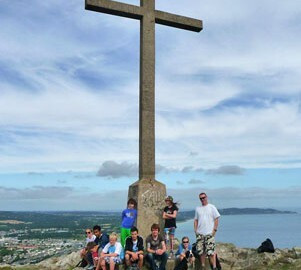 Stunning 365 degree panoramic views will take your breath away after a climb up to the iconic cross at the top of Bray Head. It also boasts the infamous Bray-Greystones-Bray Cliff Walk, with amazing views of the beautiful rugged east coast. Medieval Church 12th Century(linked to Saint Patrick), Brandy Hole – Smugglers Caves, Lord Meath Toll Gate, 1867 Train Crash, Naylor’s Cove, Flora & Fauna. Bray Head is an excellent location for spotting Falcons, Kestrels, many Seabirds as well as Dolphins, Basking Sharks and Whale Watching. 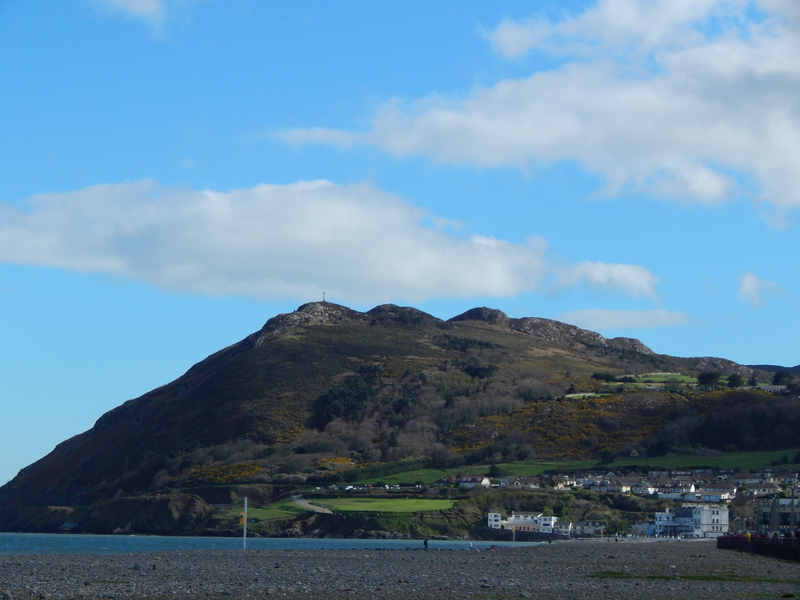 Heather, Bracken and Gorse dominate most of Bray Head. The Cliffs are also home to the Common Lizard (Irelands only species of Lizard). Pick up and departure from Bray Dart Station. You should bring- Walking boots, Lunch, Drinking Water and Rain Gear if rain is forecast! These trails and walks are suitable for all ages. Come and appreciate the great outdoors and marvel at the beauty of our wonderful mountains and seascapes. Bray is steeped in Surfing History. Did you know, Ireland’s FIRST Surf Club was in fact “BRAY IRELAND SURF CLUB” established in 1965 by good friend of Bray Adventures and Surf Legend, Kevin Cavey (First ISA Champion, 1967). Our surf instructor John McNulty is a qualified ISA Surf Instructor. John and our team can offer you an introduction to this amazing sport using Foam Boards for extra safety, comfort and stability on the waves. You and your friends, group or colleagues are in for one hell of an adventure! Adrenaline fuelled and heaps of fun, you might even hang ten at the end of your session! Surf’s Up dudes! All equipment is supplied including wetsuits. 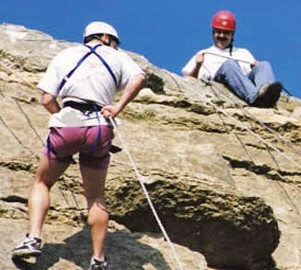 Rock Climbing and Abseiling offer a challenge and experience for all levels and ability. It combines skill, strength, strategy and of course, adventure! Our experienced and exceptional instructors will maintain safety as paramount at all times, whilst you and your group learn basic rope work techniques, climbing and movement skills, and all the encouragement to try and make it to the top! With Dalkey Quarry on our doorstep, we can offer you one of the best and most popular climbing spots on the East Coast, a total mecca for climbers. If you are looking for a new and daring challenge, this could be for you! Remember to take in the amazing views while you are there, or should we say, up there!